New bird at the feeder! 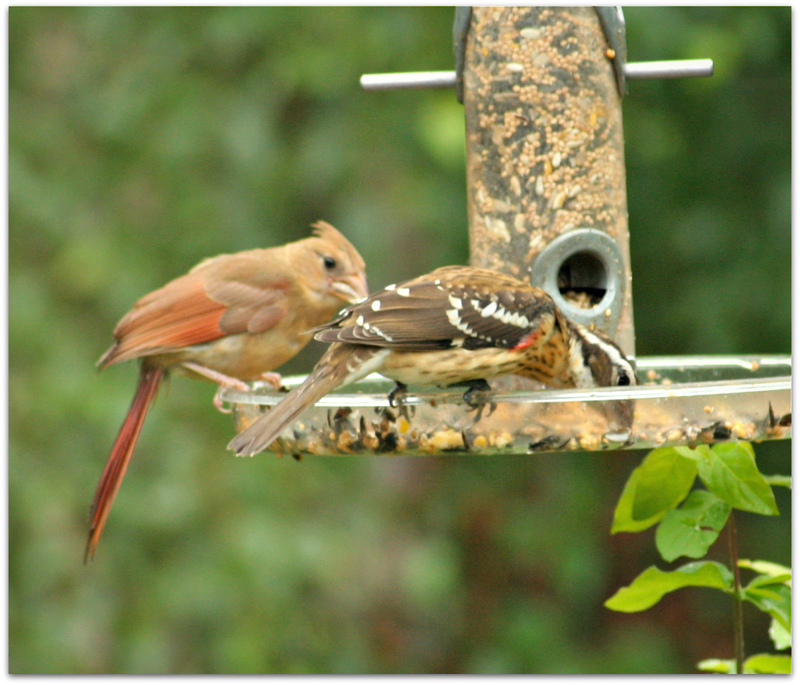 This finch-beaked fellow hanging out with the Downy Woodpecker appears to be an immature Northern Cardinal. 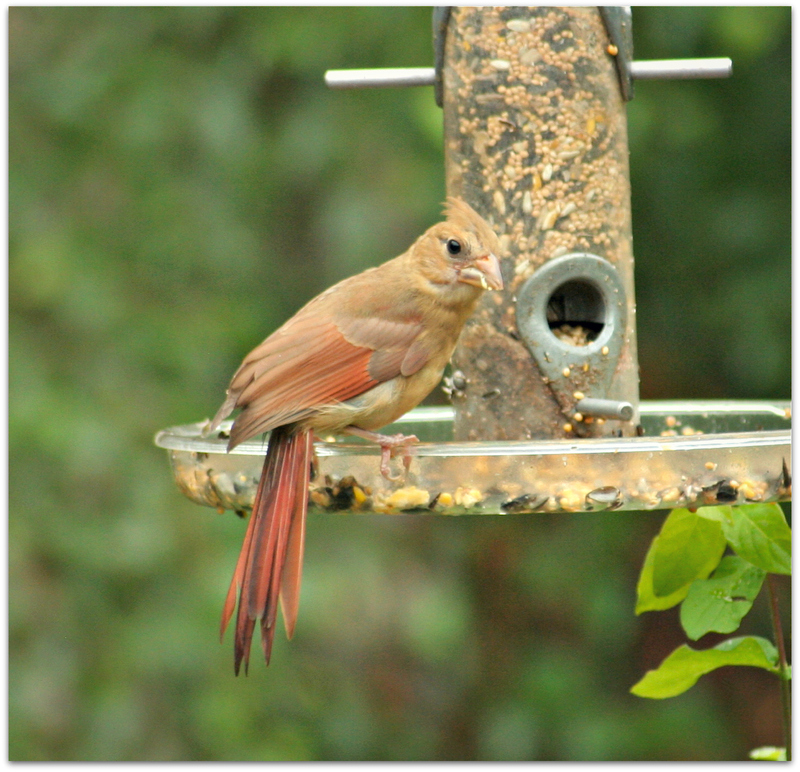 Weirdly ratty tail feathers, but cardinal shaped otherwise. Dusky bill instead of red like the adults. Not sure if it’s a male or female. I just started seriously watching birds this year, so this is my first batch of young ‘uns. They look different than their parents. And they act different – tamer, less easily alarmed. And chummier with each other. 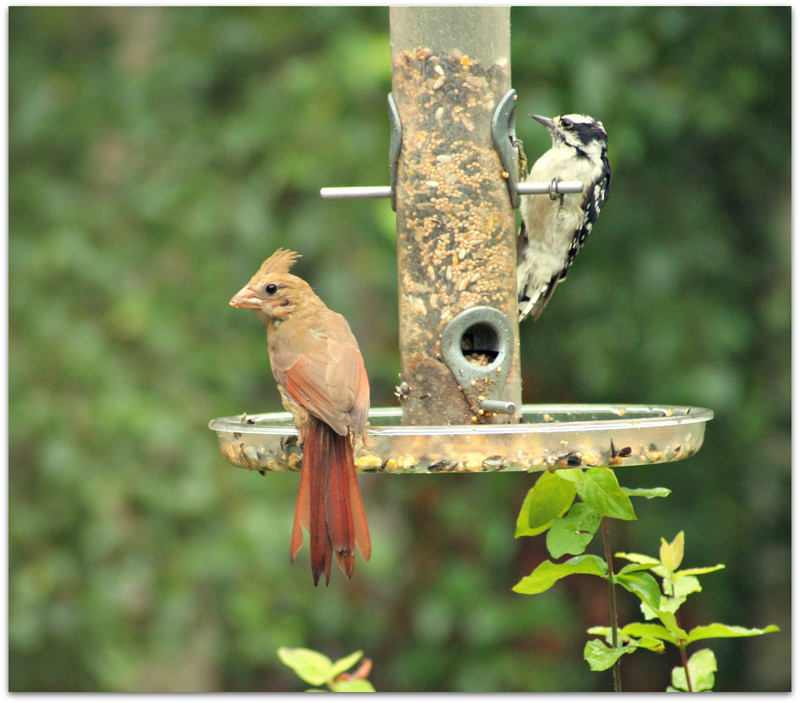 These two were pals for a while at the feeder. 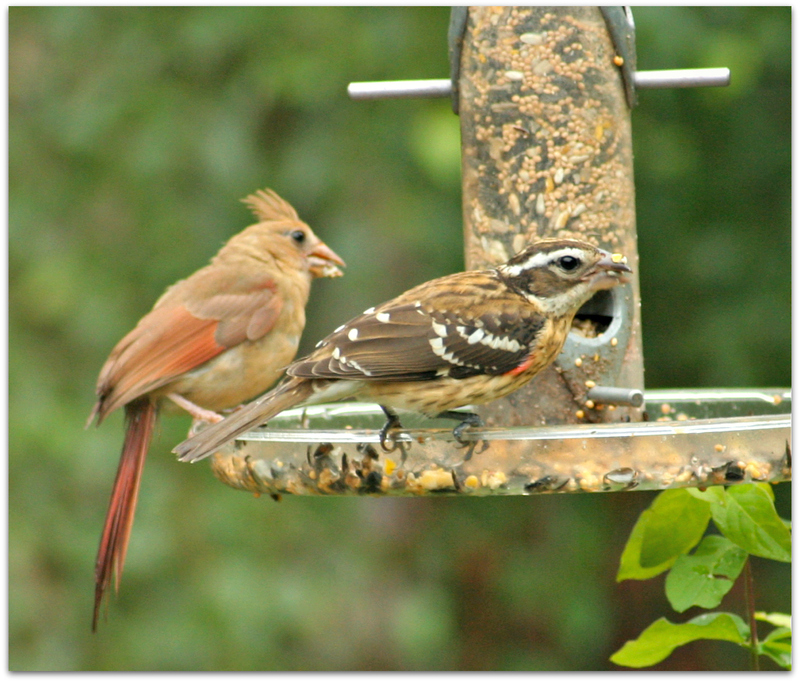 I thought the bird on the right, also a new visitor this morning, was a female Rose-breasted Grosbeak at first. But because of the red under the wing, I think it may be an immature male. 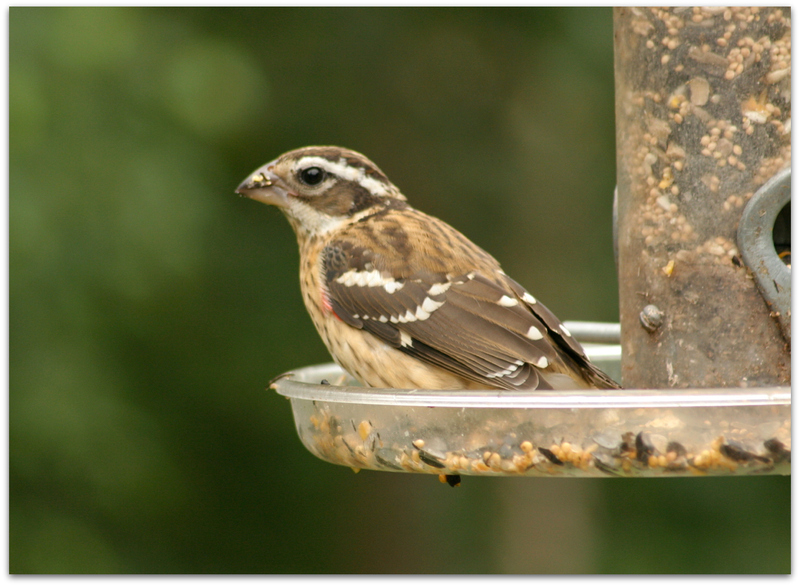 Rose-breasted Grosbeak: Females and immatures are brown and heavily streaked, with a bold whitish stripe over the eye. Males flash pink-red under the wings; females flash yellowish. Portrait of a little chow hound who has been at the feeder off and on all morning. Too hungry to bother that I was standing right next to it. The food is Dodge’s Supreme Wild Bird Food, a blend of black oil sunflower seeds, sunflower hearts, white millet, safflower, cracked corn, peanut hearts and granite grit, from our local Dodge’s Agway. Good stuff: always clean, dry and fresh. I wonder if feeding these young birds’ parents this year helped with the success of their nesting and nurturing. Welcome to our backyard, little bird friends. 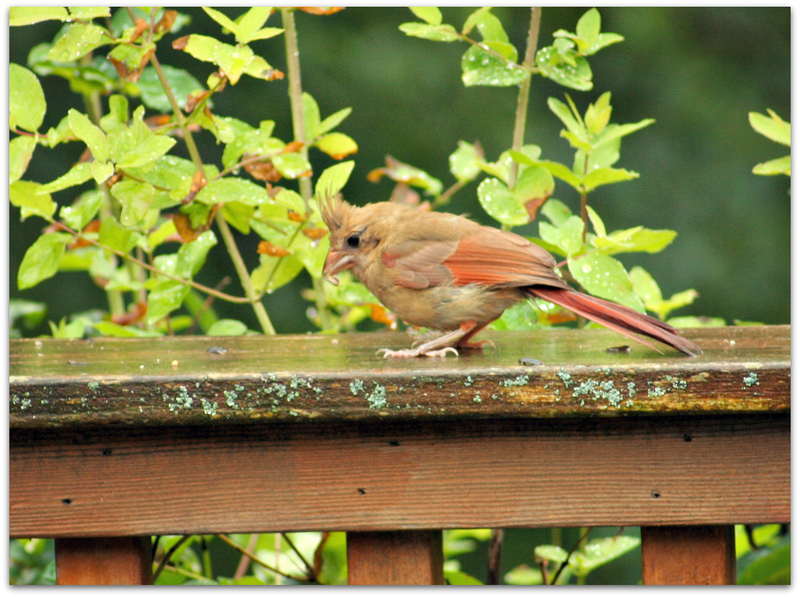 This entry was posted in Uncategorized and tagged backyard birds, birds, Northern Cardinal, Rose-breasted Grosbeak on August 2, 2014 by Amy.